Z/4153 Able Seaman Jacob Hepple, Drake Battalion, the Royal Naval Division, R.N.V.R. 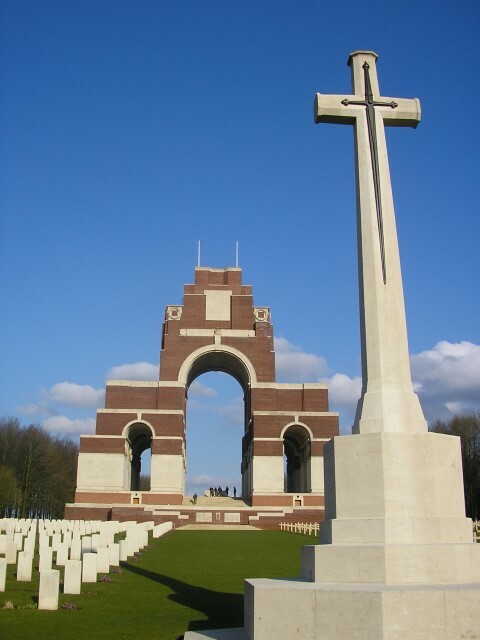 was killed in action 13 November 1916 and is commemorated on the Thiepval Memorial, France. He was 23 years old and is commemorated on the West Auckland War Memorial and the Roll of Honour in West Auckland Memorial Institute. In 1901, the family lived at the Oaks, Evenwood where 38 year old Robert was employed as a coal miner (shifter) and 18 year old William worked as a coal miner (pony putter). In 1911, the family lived at Birtley, County Durham where 48 year old Robert was a coal miner (deputy overman). 17 year old Jacob worked as a coal miner (junction boy). Later the family lived at 19 New Street, West Auckland. Jacob Hepple enlisted 15 April 1915 and was included in a draft for the Mediterranean Expeditionary Force 1 August 1915 and joined Drake Battalion. Between 20 August and 21 October 1915 he suffered from pyrexia (unknown origin). He re-joined the Battalion 2 December 1915 and served with it until his death 13 November 1916. At the outbreak of war, recognising that there was a surplus of RNVR men who would not posted to a ship, it was decided to form an infantry division. In 1914, prior to Jacob Hepple enlisting, the Drake Battalion formed part of the 1st Battalion, 1st RN Brigade RND. From April 1915 to January 1916, the Division served in Gallipoli as part of the Mediterranean Expeditionary Force (MEF). Able Seaman J. Hepple served in Gallipoli from 1 August 1915 being sick for much of the time. From there, Drake Battalion was posted to the islands of Mudros and Imbros, January to May 1916 before sailing for France to serve with the BEF from May 1916 until the end of the war. From 17 July 1916 to May 1919 it came under the orders of 189th Brigade, 63rd (RN) Division. 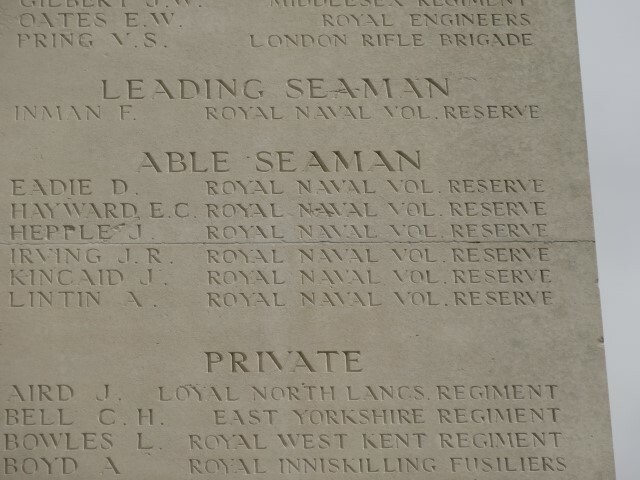 Able Seaman J. Hepple was killed in action 13 November 1916. The Drake Battalion, as part of the 63rd (RN) Division saw action at the Battle of Ancre 13 – 19 November, the final phase of the Battle of the Somme 1916. The attack was the largest in the British sector since September and a 7 day preliminary bombardment was twice as heavy as that delivered 1 July. Ultimately Beaumont Hamel, St. Pierre Divion and Beaucourt were captured, German casualties were heavy and over 7,000 German troops were taken prisoner. 189th Brigade, Hood and Hawke were to take the green dotted line and red line; Nelson and Drake were to take the green line and the red line. The front line was quickly taken by Hood and Drake Battalions but the units that were meant to pass through, Hawke and Nelson, got machine gunned and shelled into virtual non-existence, mainly at the hands of the strongpoint on Hawke’s sector that also created much havoc to 188th Brigade. The strongpoint was not indicated on any map therefore avoided artillery bombardment. Later analysis confirms that after taking the front line, the fighting became fragmented with large advances made by a few men and many Germans left in groups creating havoc. The strongpoint hadn’t been mapped and hadn’t been targeted by artillery prior to the attack thus inflicted many casualties to the Division in No Man’s Land before the first line had been reached. Many attempts had been made since 1 July to clear this section of the German line and all had failed. The efforts of the 51st Highland and RN Divisions against well prepared defences and an army determined to fight for every inch should be seen as an excellent feat of arms. The cost of the operation was great. The RND was decimated but had succeeded as had the 51st (Highland) Division. 51st Division casualties from 13 – 17 November were about 2,200. 13 November 1916, Drake Battalion lost 52 men killed in action and 1 man attached to the 188th Brigade Light Trench Mortar Battery. Able Seaman J. Hepple would have been awarded the 1914-15 Star, the British War and Victory medals. Pathophysiology, Homeostasis and Nursing p.34 pyrexia and hyperthermia Pyrexia is a normal response to invasion of the body by microorganisms and is part of the defence mechanisms against infection.